John Gayle (Don Ameche) is a movie director… and a hard-to-work-with perfectionist. His sister, Louisa (Janis Carter) takes him to a carnival, where she hopes he’ll relax a little. At the carnival, John takes notice of Mary (Dorothy Lamour), a singer and dancer whose talent captivates him as she performs in many different disguises. When the star of John’s current movie quits due to the pressure he puts on his actors, John himself gets fired from the picture. He schemes to save the movie and get his job back, asking Mary to pretend to be French and take the lead actress’ place. Mary moves into the Gayle home so Louisa and John can give her the training she needs to become a star. 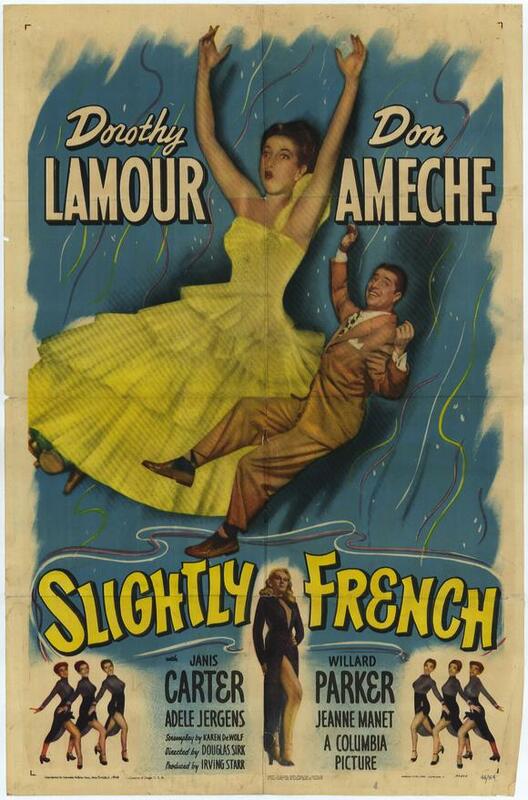 Douglas Sirk directs 1949’s Slightly French. A lovely opening dance number transitions effortlessly into the heart of this story, which is a showbiz tale about a perfectionist director. The transition is made by bringing a movie camera and crew (including the director himself) into frame as the dance number continues. Dorothy Lamour is lovable and charming as a talented, down-to-Earth girl who is at first oblivious to the director’s harsh judgment of her. The film focuses on the hard work that goes into Mary’s ascent to stardom. She undergoes accent training, French lessons, and endless rehearsals, making a Funny Face-esque transformation from unpolished carnival singer to screen starlet. Stealing the show alongside Lamour is Janis Carter as Louisa Gayle. Louisa has a strong personality and plenty of opinions, which she is never afraid to share. Carter, who I’d only seen in a few unmemorable roles prior to watching this, does very well in the role. She and Lamour are both very charming, outshining the leading man Don Ameche. Ironically, I initially selected this film for viewing because I knew that Ameche starred! I’m a fan of quite a few of his other films, especially Midnight with Claudette Colbert, so I expected him to be the star of the show here. Wrong, I was!